Laser-engraved with the four suits, they'll hold an assortment of game time treats. A smart host never shows their snack hand. Unless it's with this playful set. 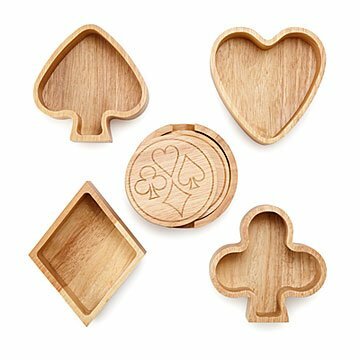 The spade, heart, club, and diamond-shaped containers hold an assortment of your favorite game treats. Laser-engraved with the four suits, the coasters keep condensation off your card table. It makes an ace gift for grandparents, summer cabins, and friendly card sharks. Made from rubber wood in China. Pair your Card Player Snack Set with our Ante Up Poker Pint Glass. Perfect for our weekly card games! I'm sure my mother will enjoy using the set. Game players who like to snack! We use these small/fun bowls when we're playing cards with friends. Perfect solution to having big bulky bowls in the middle of the table.